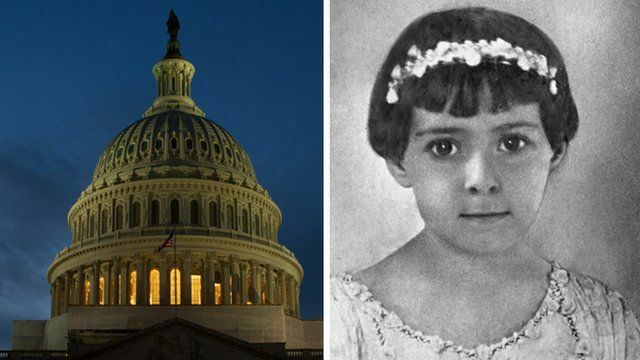 When Mary Zurhorst Gray was a young girl living in 1920s Washington DC, she used to watch the great dome of the US Congress building, the Capitol, from her home two blocks away. The daughter of a family of undertakers and musicians, she watched members of Congress, met President Calvin Coolidge, and developed a lifelong respect for the US democratic experiment. Today, Congress is back in session, but remains locked in partisan stalemate. With positions entrenched, lawmakers appear as likely to shut down the government as reach their once-treasured goal: compromise. In her memoirs, 301 East Capitol: Tales from the Heart of the Hill, 93-year-old Mary Gray recalls a bygone age and remembers five generations of Americans who lived in the neat townhouses behind the more famous Capitol Hill. And while the ice-cream parlours and funeral homes of her youth might be long gone, the towering white dome still stands - as does Mary's faith in the power of the people. Additional photo/video: Getty Images, Library of Congress, British Pathe, and courtesy Mary Z Gray.